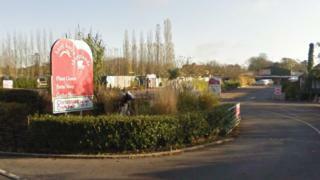 A garden centre that has been the focus of a long-running planning dispute is being threatened with court action. Hare Hatch Sheeplands (HHS), near Twyford, has been fighting enforcement action for four years for its use of green belt land. Wokingham Borough Council said the centre had failed to rectify a list of planning breaches. Owner Rob Scott said he had launched an appeal after the council refused to consider two planning applications. The authority first issued an enforcement notice in 2012 after the centre expanded its business into buildings that were on green belt land. The council said as well as failing to comply with the enforcement notice further breaches had been made, including the erection of sheds, summerhouses, hot tubs, a marquee and advertisements. Planning councillor John Kaiser said: "Unfortunately, the council considers that the time has come to take the next step towards compliance with the planning regulations, this involves further legal action through the courts which is due to be confirmed shortly." HHS, which opened in 2003, closed down a play area and petting farm in 2014 but was told subsequent applications to reopen them would not be considered. An appeal against that decision is due to be heard in September. Mr Scott, who withdrew an earlier appeal against the enforcement notice after positive talks with the council, said on 29 February he was was given 14 days to shut down other parts of the site. He said: "It seems ridiculous that Wokingham are seeking an injunction against us when we have a public inquiry in September." A petition in support of the centre, signed by more than 8,000 people, will be presented to the council on Thursday.